So you just drove off the lot with a brand new RV, and the last thing you want is for it to get dirty or damaged by the elements. It’s time to look into getting an RV cover. There are only a few options to choose from, so this is one of the easier decisions you can make when it comes to buying RV parts. I know, because I’ve been looking for one myself. Here’s what I’ve found. Fifth wheels and trucks are a match made in heaven, and you own both. You’re ready for the road, right? Not so fast. If you’re a rookie camper like me, there are a few things you need to know before you head out on the next holiday weekend. Fifth wheels provide a great way to experience camping, but if you can’t tow yours, you’ll be camping in the backyard. So for this installment, I’m going to spend some time talking about the ins and outs of hitches. Keep in mind, when considering a hitch you should also consider the towing capacity of your vehicle. While a few of the less sportier vehicles on the market, e.g. mini vans, can be outfitted to tow a fifth wheel, you might want to think twice if you drive a Smart Car. So last time I discussed how LED bulbs can benefit your RVing experience. Now I’d like to revisit that discussion and quickly address how easy it is to replace your old bulbs. We will look at two common ways of identifying the bulbs you have, the ones you need, and how to find them. First, let’s talk about identifying the bulb you have. When you remove your current bulb, examine its base. This will be the part normally consumed by the socket. 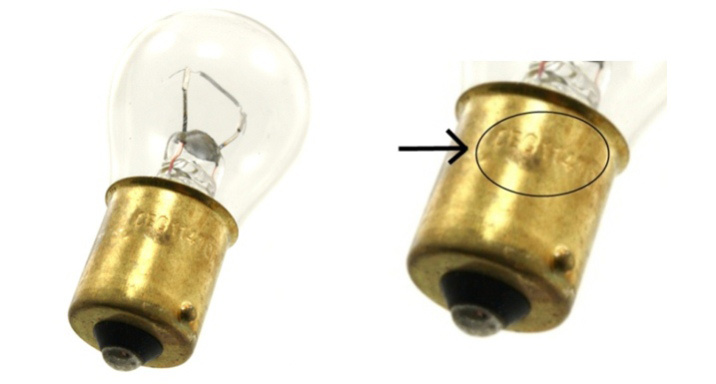 In the picture above, you can see from the base that this is a #1141 bulb type. Once you have this number it becomes very simple to search for the product. 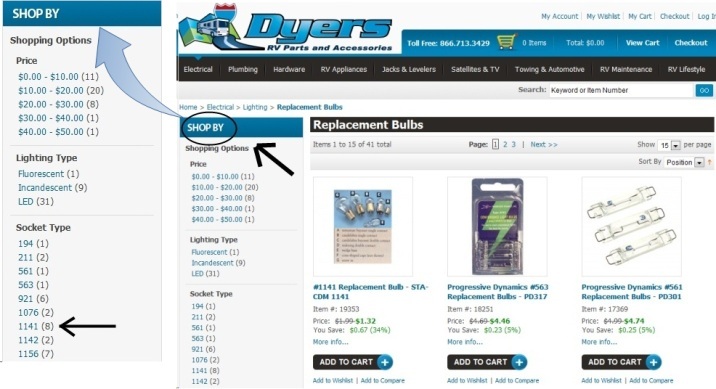 To find this bulb on Dyers Online go to the replacement bulbs section (Electrical > Lighting > Replacement Bulbs). Once there, you can narrow your search by using the “SHOP BY” tool and selecting “#1141”. This week I am highlighting a growing trend in RV improvement - LED light bulbs. LED (light emitting diodes) bulbs have long been popular for their energy efficiency and long life, but the brightness of LEDs has always failed to compete with traditional incandescent bulbs . . . until now. RV owners can now have the best of both worlds – bright lights that use 1/10 of the power of a standard bulb and burn up to 100,000 hours. The industry standard for RVs is still traditional light bulbs, so if you want to use LEDs, you will need to purchase and replace them yourself. Dyers RV is ready to supply you with LEDs for every part of your RV, from dome lights to reading lamps, but before you make a purchase, here’s what you will need to know.